Link Peace Street is a resident-organized vision for the area immediately around the intersection of Capital Boulevard and Peace Street. 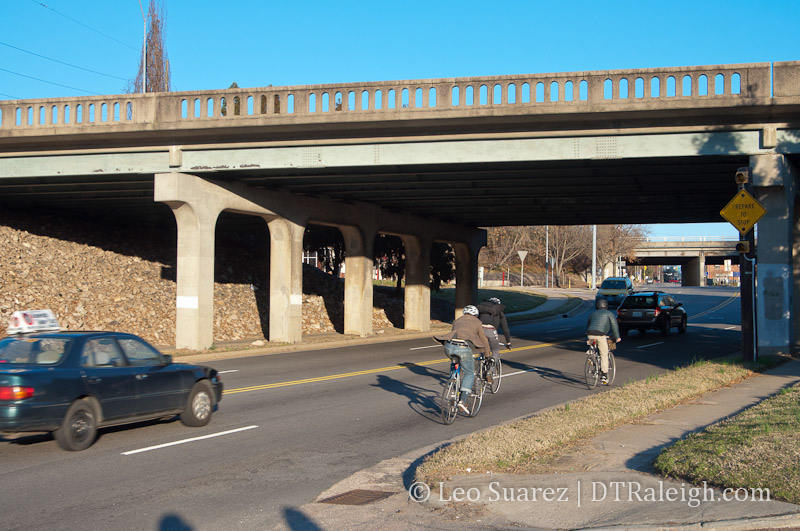 The State of North Carolina is studying plans to replace the aging Capital Boulevard bridge over Peace Street while the City of Raleigh is studying a street improvement plan for the Peace Street corridor in the same area. The group's original vision for a bridge removal, compared to a replacement, has been studied and debated at all levels. While a bridge removal will not take place at Peace Street and Capital Boulevard, the pending "Square Loop" plan, we feel, is the better plan toward achieving livable communities, spurring private investment, and increasing the amount of retail, commercial, and residential presence that is consistent with the Raleigh 2030 Comprehensive Plan. 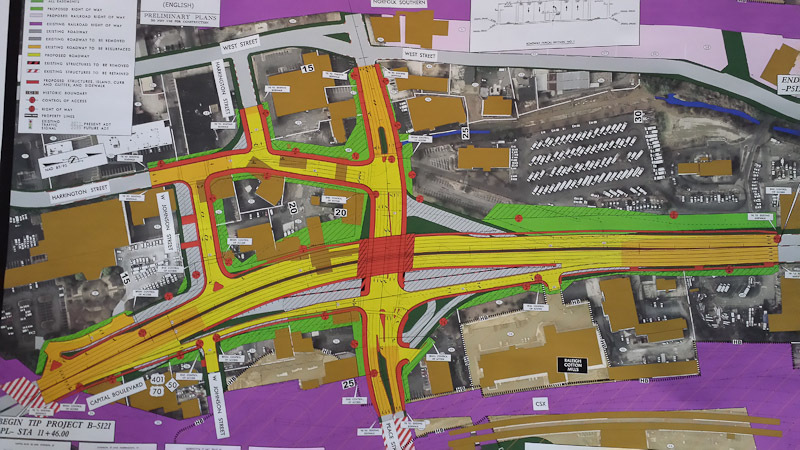 If you've been following along, the final decision on what the area around the Capital Boulevard bridge at Peace Street will look like is coming very soon. Currently, planners are taking public comments up until May 23, 2014 and will then make a decision on the final plan. The Link Peace Street group supports the P5 alternative, commonly called "The Square Loop." We are calling on all supporters of smart development, pedestrian-friendly environments, and open space to take action and tell your city council that you want to see the Square Loop happen. Email addresses to your city council are posted on the right side of this website. Please let them know what you think or copy and paste this letter telling them you support the Square Loop. Not only does Link Peace Street support the Square Loop, but others in Raleigh do as well. The all-volunteer resident group, Downtown Living Advocates, have voiced support for the Square Loop. With over 1,000 members, this group is in support of improved connectivity in the area around Peace Street and Capital Boulevard. In addition, downtown developers and property owners have voiced support for the Square Loop. 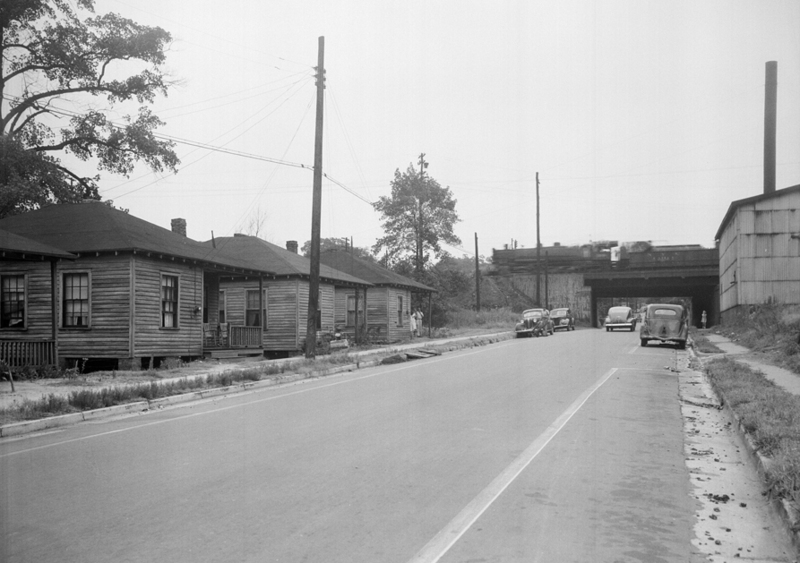 "I believe either design plan for the Capital Blvd bridge will accelerate good changes for the Peace Street area. I am as conscious as anyone for the need to economize costs, so by that measure alone the existing traffic pattern, being $11M less expensive than the square pattern, has great appeal. In my modest view, if funds are available and all other things being equal, I would prefer seeing the square traffic pattern. I believe the square pattern will improve connectivity for vehicles and pedestrians, as well as create better development sites for taller buildings." "The square loop plan ("Square Loop design", identified by NCDOT as P5 alternative . . recommended by the both the City and NCDOT) brings back the grid street design of the Christmas Plan creating an area that is more attractive to development and redevelopment of this area." "The square loop moves downtown back toward the pedestrian-friendly environment that is key to downtown's continuing success. By creating more redevelopment possibilities, the square loop will lead to a stronger tax base for all of Raleigh and aid in revitalization of the downtown core." For more background on this project, scroll down for older updates or visit the project page on NCDOT's website. Last night, [Nov 20, 2013] NCDOT were showing off proposed design alternatives of the upcoming bridge replacements for Capital Boulevard at Peace Street and Wade Avenue. This is an upcoming project that comes out of the need to replace these approximately 50-year-old bridges before they become functionally unsafe. There are plans for two different alternatives for each bridge and I wanted to go over the bridge designs at the Capital and Peace intersection. The two alternatives are being referred to as Alternative P-Base and Alternative P5. In my opinion, you have the status quo in the P-Base alternative and a new design in P5. However, as is to be expected the P-Base plan is the cheaper of the two. Let's get in to each before comparing the two against each other. Like I stated earlier, the P-Base plan seems to have the least impact to the area and delivers a new bridge with the same street design around it. Entering and exiting Capital Boulevard from Peace Street is almost the same as today. There are a few enhancements here that will help vehicles turn. The northbound entrance ramp to Capital from Peace would be two lanes wide, the right-most lane being a turn lane for the Cotton Mill parking lot. Also, when exiting downtown on Capital heading north, a right-most fourth lane will pop-out and feed the exit onto Peace Street. The same principals are there for exits and entrances on southbound Capital, where a fourth lane exists for merging compared to the abrupt turn lane that's there now. It also looks like the entrance to the small row of shops (Jersey Mike's, Dry Clean City, etc.) will not have that little driveway onto the northbound Capital ramp. Alternative P5, or "The Square Loop"
P5 has a lot more going on around the same new bridge that will be built. Capital Boulevard entrances and exits have been moved and will result in a new traffic pattern. Before we go over these, it's important to show the new street connections that are proposed. Harrington Street would play a much bigger role in the P5 plan. Here, Harrington would kind of "punch" through and connect to Peace Street, accomplished through the use of property acquisition. This would create a brand new, signalized intersection. Nearby along southbound Capital, the parallel service street, intersecting Johnson Street to the north, would be redone as well. Rather than an awkward turn off Capital, you could now make a right turn, with a dedicated turn lane, onto a connecting Johnson Street. This then drops you off at Johnson and Harrington and off into Glenwood South. Along northbound Capital, new to any proposed design yet, is a longer off-ramp with driveways to Johnson Street to the south of Peace and a turn lane to the Cotton Mill on the north. 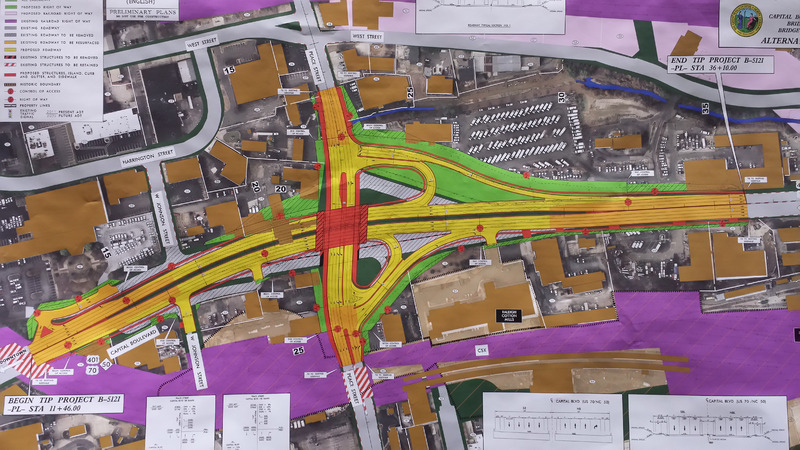 This off-ramp will create another signalized intersection at Peace Street. So with these additions, there are some things that are removed. Gone are the "cloverleaf" style on/off ramps at Capital on to Peace. With the addition of the Johnson Street connection and Harrington Street extension, traffic should flow through here in its place. The two plans don't share much but walkers and cyclists get a win with both. Peace Street will get 5-foot bike lanes and what looks like wider sidewalks, which are desperately needed as nature is reclaiming the current pedestrian paths on the south side. A minor detail that I thought was important is that both plans call for 11-foot lanes on Capital Boulevard. This actually contradicts the Capital Boulevard Corridor Study's "Happy Motoring" section stating that 12-foot lanes were something to work towards. I believe that increasing those lane widths would have created faster speeds, more vehicles, and more traffic along Peace Street. I commented in support of the 11-foot lanes for either plan as it compliments an urban area better. That's an $11 million dollar difference. The bulk of the reason comes from the property acquisition involved in each alternative, 5 versus 12 properties in the area. Overall, I left comments in support of the P5 alternative. Simply put, this area is pretty much a place to get through and not stop in. We already know that delivering the same thing will most likely produce little new results so we almost owe it ourselves to find that $11 million and try something new. I feel the P5 alternative slows traffic down and starts to transition the area towards one with better urban form. I'm a huge fan of a grid-like street network and this alternative creates that in the new connection at Johnson Street and the Harrington Street extension. If we can add in on-street parking along these areas, interest in new development could increase. It can't get any lower as the area only consists of sprawl-like, one-story buildings with surface parking. NCDOT is taking input on the alternatives over the next few weeks. Here's the project page on the NCDOT website with contact information so you can submit your thoughts. The handout also gave us a project timeline. I've added the cross section of Peace Street which shows the 5-foot bike lanes on each side of the street. The cross section is pretty much the same between the two alternatives. Click for a larger view. After the latest discussions with the city's Comprehensive Planning Committee, the Link Peace Street group has continued to raise awareness for the area's potential for redevelopment around a future walkable city grid in and around Peace Street. The future Devereux Meadow Park and West Street extension have turned into key components towards an urban place around Peace. However, after in-depth study by Raleigh city staff and feedback from the development community, the at-grade intersection vision did not merit enough quality for the future Capital Boulevard corridor. "Properties along West Street that front on the park will gain a major new amenity, strengthening the economic case for redevelopment." "To provide for a pleasant pedestrian experience befitting a downtown location and set the stage for new residential and mixed-use development in the area, the Capital Boulevard bridge needs to be as attractive as possible, and should not look like a typical highway bridge. Fourteen foot sidewalks, vertical abutments, the use of retaining walls rather than slopes, and architectural cladding are among the recommendations to improve the aesthetics of the bridge and minimize its footprint." As the plans of the Capital Boulevard Corridor Study are adopted by the city council, Link Peace Street has made them aware that this area is very important to Downtown Raleigh. Publicly funded infrastructure can spur redevelopment in a way that later on will benefit the city as a whole. We hope to see continued attention to Peace Street in the coming years as the Capital Boulevard Vision is realized. Email your city councilor and let them know what you think! Don't know your councilor? Enter your address into the city's map site for that information. We're gathering names of those interested in the project to let them know of future meetings and updates. We promise not to give out your email. If you have any questions about this project or are interested in being a part of the planning team, please email Leo Suarez. Peace St. /Wade Ave. Bridge Replacements on Capital Blvd.